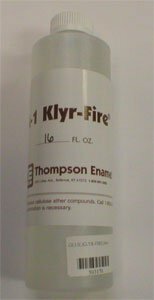 A water-based adhesive used for enameling arts. Mix 50/50 with water for a spray adhesive. Use full strength for wet packing to hold enamels in place on curved pieces before firing or for adhering cloisonne wires. If you have any questions about this product by Delphi Glass, contact us by completing and submitting the form below. If you are looking for a specif part number, please include it with your message.